Our summer camp offers a Swim Program that includes both instructional and recreational swim every day in our safe, comfortable child-size pool. Our specially-designed outdoor pool features a wading area and a shallow, 3-foot-deep swimming area, providing an inviting and rewarding swim experience for every camper. Our pool is staffed by two American Red Cross certified lifeguards, one of whom is also a Water Safety Instructor. With no more than 18 swimmers at any time and highly-qualified staff on duty, every child can enjoy a safe, comfortable – and fun! – swim experience. 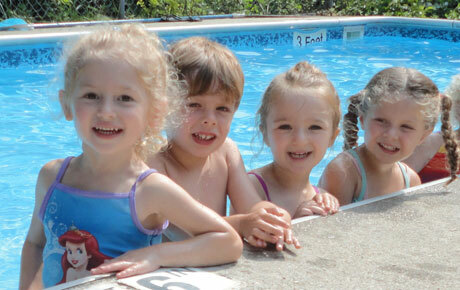 Campers age 4 and older can also participate in the Dolphin Swim Club. This program offers an extra hour of recreational swim after the usual camp day (from 2:00 pm to 3:00 pm) and is available for 2, 3 or 5 days per week with no minimum number of weeks. Campers age 5 and older are developmentally ready to participate in organized activities that require adherence to some basic game rules and the ability to function in a team setting. They are also ready for a more physical and challenging camp experience than their younger counterparts. As part of every camp day, children in the early elementary groups participate in our Sports Program. The Sports Program emphasizes skills development, cooperative play and good sportsmanship at an age-appropriate level. 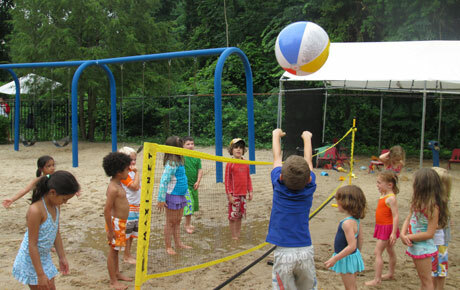 Campers learn and practice introductory skills in some of their favorite sports such as volleyball, soccer, basketball, kickball and group games.